Everyone who has ever been to the The Little Brown jug will have a story to tell. Concessionaire Kathy Gerasimof has many stories after working in North Star Concessions right under the grandstand for 27 years. “I’m actually from northern Minnesota and the first year I came here they were talking about The Little Brown Jug in Delaware and I thought, ‘what the heck is that,’ but certainly found out,” said Gerasimof, who now lives in Morrow County. 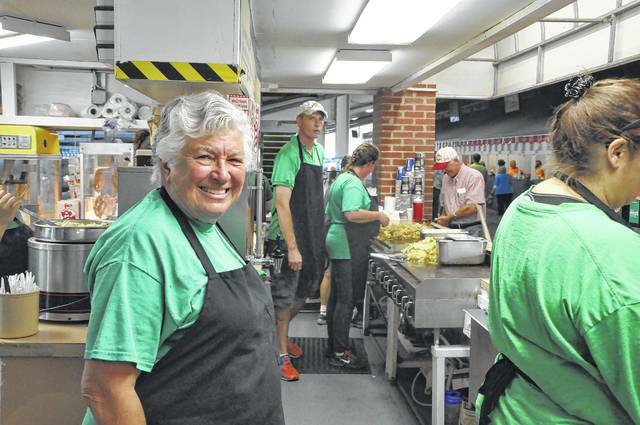 Now, nearly three decades later, Gerasimof and her family run North Star Concessions along with various other food stands, an ice delivery service, and catering for the stretch tents and other special events like the Veteran’s Dinner. “I certainly got myself in a pickle,” Gerasimof laughed. The Delaware County Fair is a special week, Gerasimof said. She arrives at the fairgrounds a month early each year to repaint and refresh her concession stands. Gerasimof said the fair has changed a lot in the last 20 years and she has so many fun memories associated with it. “The fair has changed drastically, because 20 years ago after The Jug was over I’d hear all this unbelievable crashing because they were throwing trash from the grandstands … and they didn’t have plastic bottles back then — they were glass bottles! It was treacherous!” Gerasimof said with a laugh. One of the most memorable fairs Gerasimof said she has participated in was in 2001, when the fair occurred one week after the September 11 terror attacks in New York City and Washington, D.C.
Another time Gerasimof said she’ll never forget was the 2008 fair when Hurricane Ike went through Ohio. Gerasimof said the fair and Jug Day present challenges, but said she keeps coming back for the atmosphere and the people. “I just love it,” Gerasimof said. Kathy Gerasimof stands in the North Star Concessions stand Thursday morning just before the races begin. Gerasimof said Jug Day has its own special atmosphere and she loves to be a part of it. This entry was tagged delaware county fair. Bookmark the permalink.